Faster than a speeding bullet, this supergiant star looks like it might be wearing a red cape. Alpha Camelopardalis, the bright star in the middle of this image, is a runaway star, moving at incredible speeds – astronomers believe could be zooming along at somewhere between 680 and 4,200 kilometers per second (between 1.5 and 9.4 million miles per hour). The speed of this star is so fast, a huge bow shock is being created as the star moves through space. 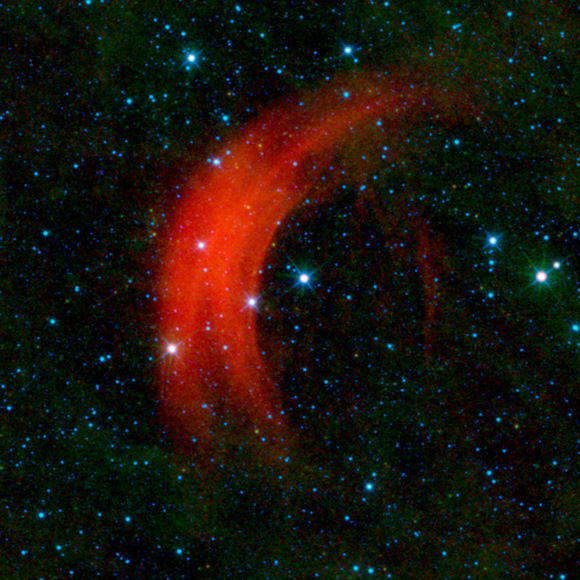 Alpha Cam’s bow shock can’t be seen in visible light, but WISE’s infrared detectors allow us to see this arc of heated gas and dust around the star. The colors used in this image represent specific wavelengths of infrared light. Stars are seen primarily in blue and cyan (blue-green), because they are emitting light brightly at 3.4 and 4.6 microns. Green represents 12-micron light, primarily emitted by dust. The red of the blow shock represents light emitted at 22 microns. Couldn’t it also have been thrown out by interaction with a super-massive black hole? As to your second question: I learned that one possible explanation for such stars is that they were once part of a binary system which interacted with the super massive black hole at the galactic centre – resulting in one star falling into the black hole, while the other one is being accelerated enough to eventually escape the Galaxy. Apparently, there are more than a dozen such stars known, which have already escaped. Or perhaps one (instance of the star) fell into a black hole and the other escaped as hawking radiation? Or perhaps the star is an Interstellar spaceship?. It would take the energy output of an average star to achieve it. 🙂 Really is all speculation. We may know of a few stars that have left their galaxy’s, but the means by which it occurred is pure conjecture. “A runaway star is one which is moving through space with an abnormally high velocity relative to the surrounding interstellar medium. The proper motion of a runaway star often points exactly away from a stellar association, whose member it therefore once must have been before it was hurled out. * In the first scenario, a close encounter between two binary systems may result in the disruption of both systems, with some of the stars being ejected at high velocities. * In the second scenario, a supernova explosion in a multiple star system can result in the remaining components moving away at high speed. Maybe I should mention (or not? ), that supernova remnants are quite visible at times. Mabe this illustrates the gravitational waves in the overall electromagnetic field of the Universe? LOL. Is that the potential of an EU “theory”? It could have started out as a member of a triple or quadruple star system. I remember reading somewhere that if you have more than 2 stars of equal mass in a system then one or more of them will be ejected.